Straighten the seat backrest 2 and secure it. Check that the red indicators, located next to the controls 1 , are no longer visible. 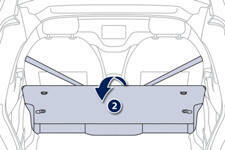 Unbuckle and return the seat belts to the sides of the backrest. When repositioning the backrest, ensure that the seat belts are not trapped.